The Northeast Conference now has two teams ranked in the CollegeInsider.com Men’s Basketball Mid-Major Top 25 Poll. The latest rankings came out Tuesday with Wagner joining Robert Morris amongst the nation’s best. Robert Morris (10-3) was in the poll for a second straight week, moving up four spots from its initial position to No. 20. Meanwhile, Wagner (8-3), which matched its single-season program record for non-conference wins (7) by beating Pitt last week, cracked the rankings at No. 25. Dan Hurley & Co. are surging on Staten Island. The NEC had a presence in the women’s poll as well. Sacred Heart (9-2) remained ranked amongst the nation’s top-25 mid-major programs, coming in at No. 21. Robert Morris (8-3) saw its three-week run in the poll end, finishing just outside of the Top 25. The Colonials were the top team in the ‘receiving votes’ category. The holiday season is winding down, but NEC hoops is just about to begin cranking up. After a four-day break in the men’s basketball schedule wrapped around Christmas, the action resumes on Wednesday, Dec. 28. Both ends of the Garden State rivalry return to the floor on Wednesday night. Fairleigh Dickinson (1-9) heads to Newark to take on NJIT while Monmouth (2-10) crosses the Delaware Water Gap and faces Lafayette in Easton. Quinnipiac scored a season-high 85 in a four-point win over Niagara on Dec. 22 heading into the break. Playing on the road for the fourth time in five games, the Bobcats (6-5) will visit Colgate in an attempt to even their record against Patriot League members this season. Quinnipiac beat Navy by 24 but suffered an 11-point loss to Lehigh and fell to American by one. Robert Morris and Wagner restart their seasons on Dec. 29. Andy Toole’s Colonials (10-3) travel to Memphis while Dan Hurley’s Seahawks, fresh off grabbing national headlines for a Dec. 23 win at Pittsburgh, tip off play against Air Force at the annual Cable Car Classic in Santa Clara. When studying the NEC team stats leader board, it should come as no surprise that Robert Morris and Wagner happen to have the two best records amongst the league’s 12 men’s basketball teams. The two teams are No. 1 and No. 2 in terms of both scoring defense and field goal percentage defense. No team surrenders fewer points than the 59.8 ppg the Colonials allow. Wagner is second, giving up 64.5 ppg, but is actually a tick ahead of Robert Morris in the field goal percentage defense category. The Seahawks (.402) and Colonials (.403) are neck-and-neck atop the leader board in what was Mike Rice’s favorite statistical category. Rice is no longer the coach at Robert Morris, having moved onto Rutgers and handed the reins to the more-than-capable Toole. Still, the words Rice spoke following the 2010 NEC Championship Game are still ringing true. His Colonials held Quinnipiac to a .348 field goal percentage in that 52-50 title tilt triumph and led the NEC that season at .407. Robert Morris is in its second season post-Rice, but defense is still winning in the NEC. On the women’s side, play resumes with a conference matinee featuring New England Collision counterparts Central Connecticut and Bryant. Both teams dropped their conference openers during the first week of December and have cooled off after shooting out to fast starts. Bryant finds itself at 6-4, still its best start at the Division I level, but is coming off a 20-point loss to Holy Cross. Meanwhile, Beryl Piper’s Blue Devils (6-5) have encountered some road problems after winning four of five at home. Central has lost its last three, all away from New Britain, falling to James Madison, Hofstra, and Auburn. An intriguing game within the game should be present down low in this one where Naana Ankoma-Mensa and Kirsten Daamen roam. The former, in her second season at Bryant, is the NEC’s fourth-leading rebounder (9.3 rpg). In her third collegiate campaign, the 6-foot-3 Daamen has been the conference top shot blocker, having swatted away 28 attempts in 11 games. Follow Bryant-CCSU live. Tricia Fabbri’s Quinnipiac Bobcats play one of the four night games on the Dec. 28 NEC women’s slate. The Bobcats (7-3) will look t o make it three wins in a row when they play at American in the first leg of back-to-back games at Patriot League members. QU will visit Army on Dec. 30. St. Francis (NY) will visit NYC rival, and MAAC member, Manhattan in what will be a homecoming of sorts for Terriers’ assistant coach Dionne Dodson. Prior to a stint at Fordham and her current stay at SFNY, Dodson served as an assistant on former Jasper head coach Myndi Hill’s in Riverdale. Four NEC teams – Wagner, Monmouth, Saint Francis (PA), and Long Island – will partake in holiday tournaments this week. Wagner will be the first to tip off when the Seahawks face host UVA at the Virginia Cavalier Classic on Dec. 28 in Charlottesville. Monmouth will host the Hawk Holiday Classic on Dec. 29-30. Long Island will contest the Reno-Tahoe Classic beginning with a bout against Nevada on Dec. 29. SFPA is in the great American northwest for the Seattle Holiday Hoops Classic on Dec. 29-30. The Flash face Seattle first. Ready for Some More Wagner Hoops? How about against the defending NEC champ on ESPNU? Whether Wagner fans have been naughty or nice this year, they received an early Christmas gift. In case ESPU wasn’t on in the background of the holiday party you were at last night, Dan Hurley’s Seahawks stormed into the Petersen Events Center and came away with a 59-54 victory over No. 13 Pittsburgh. The win was the first-ever by a NEC team over Pitt and it ended Wagner’s 13-game losing streak against Big East members. It’s the kind of victory that will open some eyes on the NCAA Committee come Selection Sunday. OF course, the Seahawks, have a long way to go before thinking about March. First, they head out west for the 45th annual Cable Car Classic, which begins on Dec. 29. There, they will face Air Force and either Santa Clara or Eastern Michigan. Then, of course, there are 16 more Northeast Conference games to follow with the league schedule heating up in the New Year. But for now, the Seahawks will have some time to enjoy what was the program’s biggest win in nearly a decade. Overtime! has included a number of links below for you to enjoy the victory as well, including Wagner trending near the top of Twitter into the wee hours last night! @RealJayWilliams – Dan Hurley is THE up & coming coach in college basketball. #Wagner is playing like a team that believes they deserve to win against #Pitt. @dhurley15 – Awesome nite for our players,college n program. Scout on point by @BobbyHurley11 n great work by coaches. Our kids deserved it-their nite! 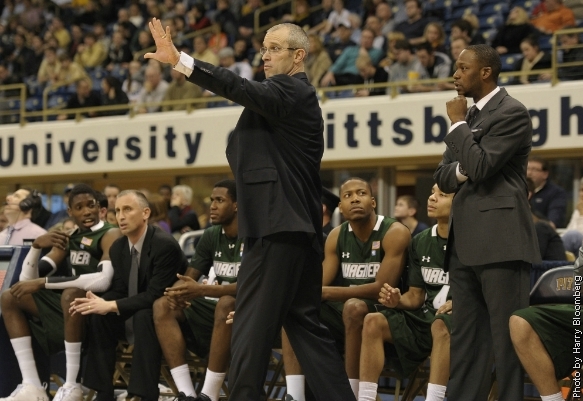 @ICGaels – Congrats to @dhurley15 and @WagnerAthletics with their win at #Pitt! @BruceBeck4NY – Seahawks Shocker! Congrats 2 @WagnerAthletics (8-3) who beat #15 Pitt! @dhurley15 with help from @BobbyHurley11 doing awesome job! The upset of Pitt may not have been possible had Latif Rivers not caught fire after the break. Rivers, an NEC all-rookie selection last year, was scoreless for the first 20 minutes against the Panthers before exploding for 18 second-half points. Even more impressive than the second-half explosion had to be the sophomore’s poise under pressure when he converted all six of his free throws in the game’s final minute. Pitt doesn’t lose non-conference games at home, or at least not very often. Illustrating just home rare the home loss was is the factoid that the Panthers hold a 91-3 all-time record at the Petersen Events Center against non-conference opponents since the facility’s opening. Just another reason for Wagner fans to say What a Win! Four of six men’s games on the Dec. 22 slate are regular season re-matches from last year. … Mount St. Mary’s travels to Savannah State after topping the Tigers, 68-63, at Knott Arena last November. … Quinnipiac will look to post a win over Niagara for the second year in a row with the Bobcats having beaten the MAAC member during last December’s meeting in Western New York. … Looking to improve upon its league-best 9-3 overall record, Robert Morris heads to Youngstown State in the next chapter of the regional rivalry. In what was head coach Andy Toole’s first season at the helm, the RMU Colonials defeated the Penguins, 90-60, at “The Chuck.” One key question for the Colonials will be the status of swingman Russell Johnson who suffered a broken nose the last time out against Hampton. … Monmouth hosts I-195 rival and MAAC member Rider at The MAC on Thursday night. King Rice’s Hawks are heating up of late and will look to atone for last year’s 74-54 loss in Lawrenceville. Central Connecticut has faced a pair of Big Ten opponents (Michigan State, Northwestern) as part of its tough non-conference schedule in recent weeks, and now Howie Dickenman’s bunch will take on an Atlantic-10 member. The Blue Devils host LaSalle at Detrick on Dec. 22, looking to improve upon the 3-2 record NEC teams have posted against A-10 opponents this year. Robert Morris is responsible for two of t he NEC’s three wins vs. the A-10, having taken down LaSalle and Steel City rival Duquesne. Central Connecticut’s triple scoring threat should receive a good test on Thursday night. Ken Horton (22.5 ppg), Kyle Vinales (20.6) and Robby Ptacek (19.1), all amongst the top-35 scorers in the nation, will go up against a stingy LaSalle defense that allows 63.1 points per contest. Sacred Heart could not pull off the upset at Boston College last night, but it was still a memorable evening for veteran Pioneer Shane Gibson. The guard, who scored 25 points in 27 minutes during the 83-73 setback, became the 173rd player in NEC history to break the 1,000-point barrier for his career. Wagner and its former Big East point guard head coach Dan Hurley play at Pittsburgh on Friday, Dec. 23. The Seahawks and Panthers will tip off at 8:00 pm and the game can be seen live on ESPNU and ESPN3. Robert Morris has added some firepower to its arsenal when it welcomed transfer forward Mike McFadden into the rotation. The 6-foot-8, 220-pound power forward from Newark, NJ has averaged 12.0 points and 5.0 boards over his first two appearances. Central Connecticut women’s basketball dropped a pair of tightly-contested decisions to Hofstaa and Auburn at the Hofstra Holiday Classic out in Hempstead on Dec. 21 & 22. Meanwhile, the Blue Devils’ head coach Beryl Piper was featured on Northeastconference.org as part of the league’s Title IX 40th Anniversary Celebration. Read Piper’s Passion: A Conversation on the Past, Present and Future of Central Connecticut Women’s Hoops. Robert Morris women’s basketball outlasted Akron at “The Chuck” yesterday and is now a perfect 3-0 against teams from the Mid-American Conference. The Colonials also own wins over Kent State and Central Michigan. Meanwhile, NEC teams are a combined 5-0 vs. the MAC. After two games on Dec. 22, one of being Central’s afternoon setback to Auburn at the Hofstra Tournament, NEC women’s hoops goes on hiatus until Dec. 28. 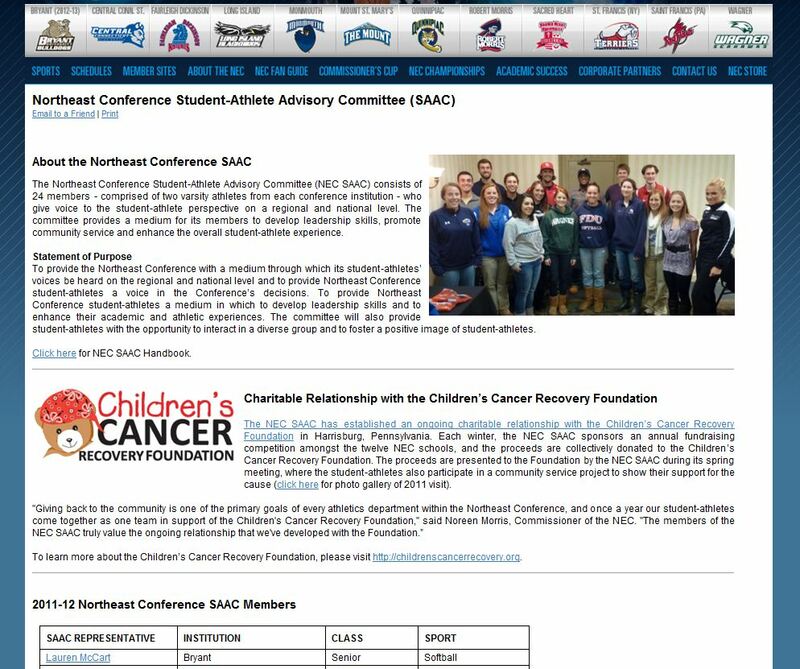 The Northeast Conference Student Athlete Advisory Committee (SAAC) has a home on the recently-relaunched NortheastConference.org. 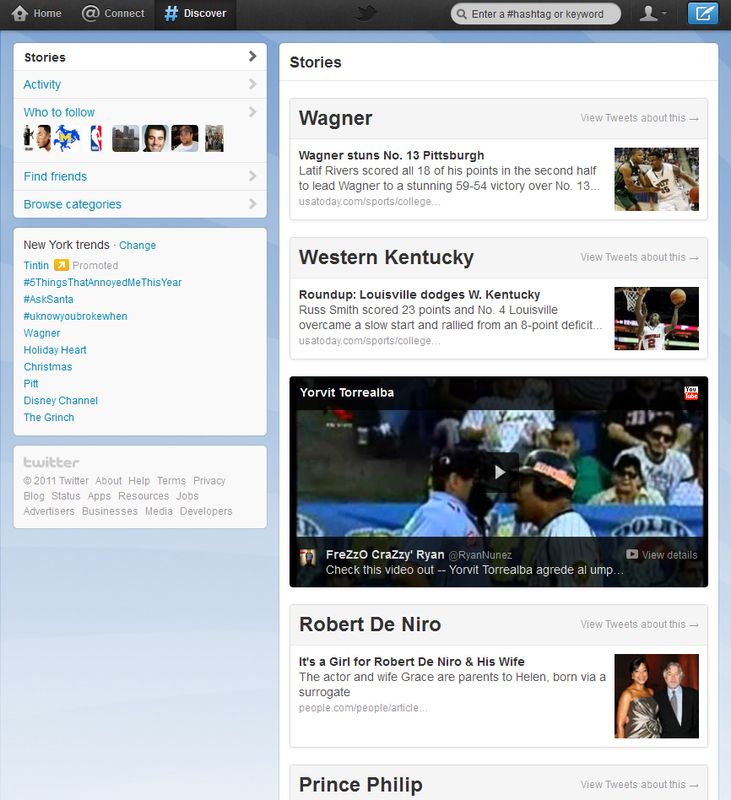 The league unveiled the new SAAC-specific page just in time for the Holiday Season. The webpage contains a NEC SAAC member directory along with information on the group’s community service initiatives. Visitors can also find important links for SAAC-related organizations and events on the new page. “The webpage is just another wrinkle to the conference’s awesome new website. It will give NEC fans an opportunity to follow the activities of the NEC’s Student Athlete Advisory Committee,” said Kelly Webb, who serves as the league’s SAAC advisor. Later this winter, the NEC SAAC will sponsor its annual fundraising competition amongst the conference’s 12 member institutions, with the proceeds going to the Children’s Cancer Recovery Foundation. @The_Real_Nate66 – RT @JeffLink34 Anyone else just see Joe Walton on ESPN? @christierampone – We counted 27 training sessions including pumping iron, long balls & everything soccer related during the last camp. Ready for qualifying??? There’s been no snow yet, but there has been a final flurry of games before Christmas. In fact, it has yet to subside. Robert Morris and Long Island, who faced each other in the 2011 NEC Men’s Basketball Championship Game, picked up pre-Christmas wins for the NEC in non-conference play on Tuesday night (Dec. 20). The Colonials moved to 9-3 overall, the best mark amongst all NEC teams, by topping Hampton (MEAC) at home, 64-54. “I thought that was a very good win for us. Hampton’s a talented team and can do things that can cause us a lot of issues,” surmised RMU’s second-year head coach following the win over the MEAC member. The win did not come without a cost as Colonials’ swingman Russell Johnson played only 11 minutes before going down with an injury. Toole later said it was diagnosed as a broken nose, and hopes to have him back soon. “There were a number of reasons tonight we could have said ‘Hey, it’s not our night. Russell went down. They’re guys are big, etc.’ but our guys continued to work and continued to battle,” said Toole of Robert Morris’ resiliency. Meanwhile, the Blackbirds took center stage in Downtown Brooklyn, hanging 100 on Southland Conference member Texas State in a 100-84 triumph. LIU (7-6) is done until Dec. 30 when NJIT crosses the Hudson River to face Jim Ferry’s Blackbirds. Andy Toole’s Colonials will squeeze in one more contest at Youngstown State on Dec. 22 before taking a short holiday break that ends with a Dec. 29 date in Memphis. Fairleigh Dickinson will host Vermont and Sacred Heart will visit Boston College in the two men’s games on the Dec. 21 docket. Both contests begin at 7:00 pm EST. Robert Morris’ bout at Youngstown is one of six scheduled men’s games on Dec. 22. Monmouth will host I-195 rival Rider at the Jersey Shore. Bryant battles a Pac-12 member in its trip to Arizona. Central Connecticut looks to defeat A-10 member LaSalle, a team that RMU beat earlier in the season. There are three games, one being between Dan Hurley’s Wagner Seahawks and Jamie Dixon’s Pitt Panthers, on Christmas Eve Eve aka Dec. 23 before a four-day break in the NEC hoops schedule, which resumes after Christmas on Dec. 28. The women have also been/will be active on the hardwood in the few days left before Christmas. Quinnipiac won a non-conference game for the sixth time in a row as Felicia Barron treated Yale like a Christmas Tree, lighting up the Bulldogs for 24 points in a 68-63 win. Barron made five steals, seeing her NCAA-leading steals per game average drop a fraction (6.1). There are five women’s games on Dec. 21 with two of them tipping off prior to noon. Robert Morris hosted Elementary School Day at “The Chuck” and Artemis Spanou gave the children a reason to get rowdy during the game that started at 10:00 am. Spanou poured in 24 points as the Colonials topped Akron, 85-78, to run the NEC’s record at MAC members to 5-0 this season. Bryant battled Holy Cross in an 11:45 am start. Wagner and New Hampshire will close out the day’s slate with a 7:00 pm tip-off from the Spiro Sports Center on Staten Island. Central Connecticut, which opens play in the Hofstra Holiday Classic against the host Pride on Wednesday, will play one of two games on Dec. 22 docket. The Blue Devils’ Thursday opponent is TBD, while Fairleigh Dickinson will host MAAC member Rider in a battle for Garden State bragging rights. After the two tilts on Dec. 22, NEC women’s hoops goes into hibernation until Dec. 28.